Whilst Quizzes are created under the Quizzes Tab and used to record student data at the end of a Course or Unit, Checkpoint Templates act as formative assessments throughout your Courses, and are created from within your Lesson Pathway. In other words, Quizzes are used as a formal assessment tool, whilst Checkpoint Templates are practice quizzes that let your students test their own knowledge. For this reason, Participants can attempt to retry the questions in a Checkpoint Template as many times as they wish. Checkpoint Templates can be found under the ‘Checkpoint Questions’ section of your Lesson Pathway, as seen below. From the Checkpoint Questions box, you can choose a specific Checkpoint Template, such as a Multiple Choice or True/False Template, which can then be dragged into your Lesson Pathway. Within a Checkpoint Template, you can add other types of questions – for example, we may drag a Multiple Choice Template into our Lesson Pathway, but within that template we can add True/False questions as well. Let’s take a look at how to build a varied Checkpoint Template – first we’ll need to drag our template into the Lesson Pathway. Let’s choose the Multiple Choice Template as an example. Now, we can give our Checkpoint Template a title. Click the ‘edit’ button to begin editing your new Checkpoint Template. 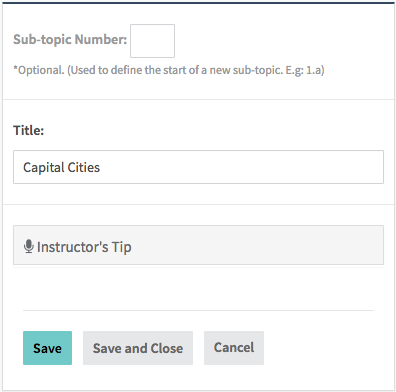 Within the edit screen, we have the option of changing our title, or adding an ‘Instructor’s Tip’. To the right of the edit screen, under the ‘Checkpoint Question Editor’, you’ll see that a Multiple Choice question already exists. Click on the ‘edit’ button to begin building your Checkpoint Template. 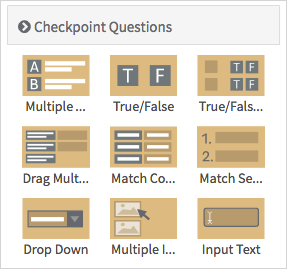 From within the question editor screen, you can choose which question type you’d like to add to your Checkpoint Template. As seen here, the Multiple Choice option is already selected as that is the template we dragged into our Lesson Pathway. Remember that you can add multiple question types to one Checkpoint Template, allowing you to vary your questions and keep your Participants engaged. We suggest using 3 or 4 different question types to challenge all areas of your Participants’ learning. For example, the Multiple Choice and True/False questions are a great and familiar way to test recognition memory, whilst the Input Text question type is good for testing recall memory, and the Multiple Image Choice question tests visual recognition and understanding. A mix of questions such as these results in a comprehensive and fresh informal assessment tool.